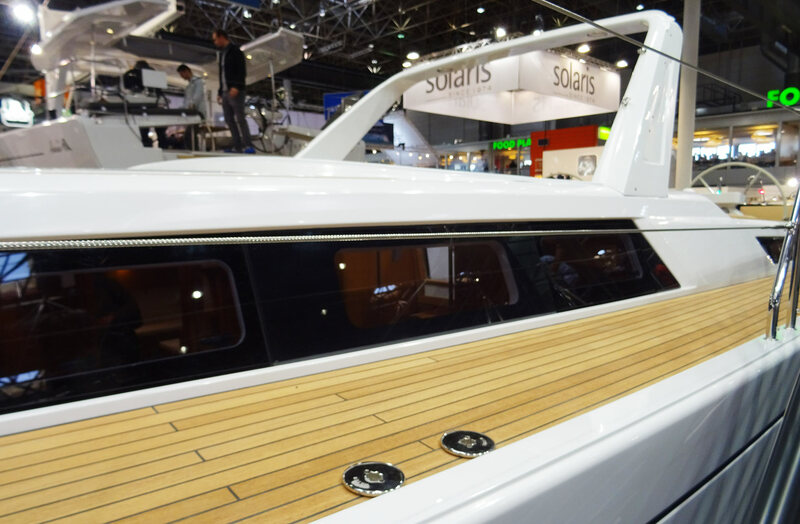 As I was strolling around in the sailing halls of Boatshow Dusseldorf there was something that was constantly pulling me and letting me go past the Grand Soleil stand. I don´t really know what it was in the end because I don´t have a specific connection with that Italian brand, but something drew me towards the boats and finally I gave in and entered the stand. Huge portholes – sleek lines. 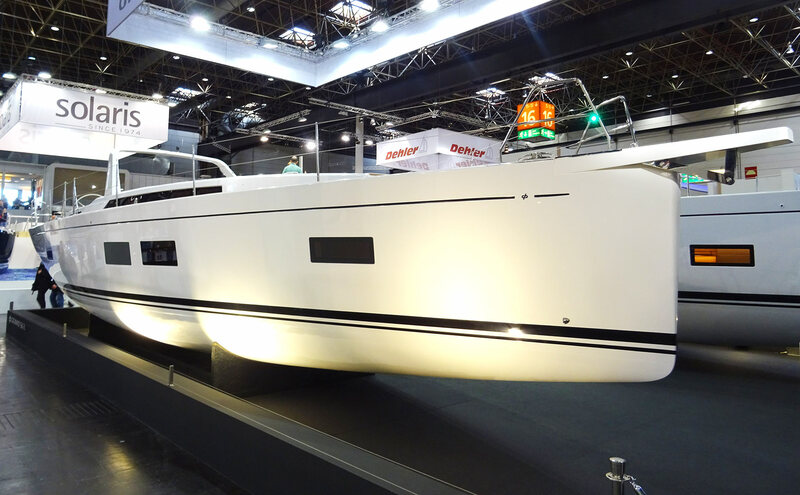 To my surprise, it hasn´t been for the Grand Soleil 58 Performance which was at display but the smaller 46 foot Cruiser that had my full attention. I love the big boats, but all that dreaming is wasted due to the fact that I will never be able to sail such a huge boat (read my article about why boats are growing bigger and bigger ever since here). But it was this (still huge) 14.72 long cruiser that somehow fascinated me. Grand Soleil is the name of a range of well known high-class sailing yachts made by the yard Cantiere del Pardo which is situated in Forli, between San Marino and Bologna. This is a landscape I know very well since I was some kind of a semi-pro race biker and did race often around Cesenatico. That it was here where those neat sailing yachts are made was a fact not long know by me. Cantiere del Pardo makes fine sailing yachts since 1973 and has a longstanding tradition in making Mediterranean style, fast sailing and luxurious yachts. Right now they do have a cruiser range with two models of 46 and 58 feet and their – most known – Performance range of 6 models. 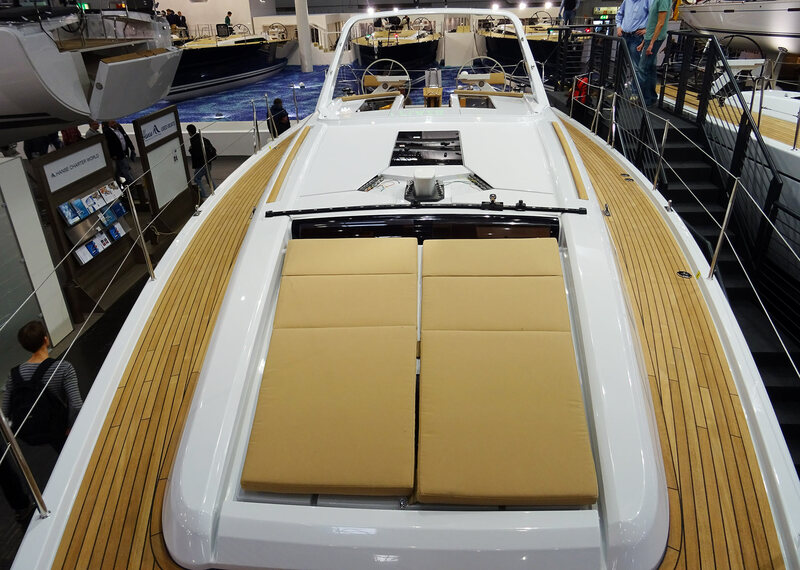 Umberto Felci, whom I had for a very interesting interview during Boatshow Dusseldorf (stay tuned!) did design the latest, Performance 58 boat. But as I had only eyes for the Long Cruise 46 model, I asked myself what it was that was pulling me toward this boat. 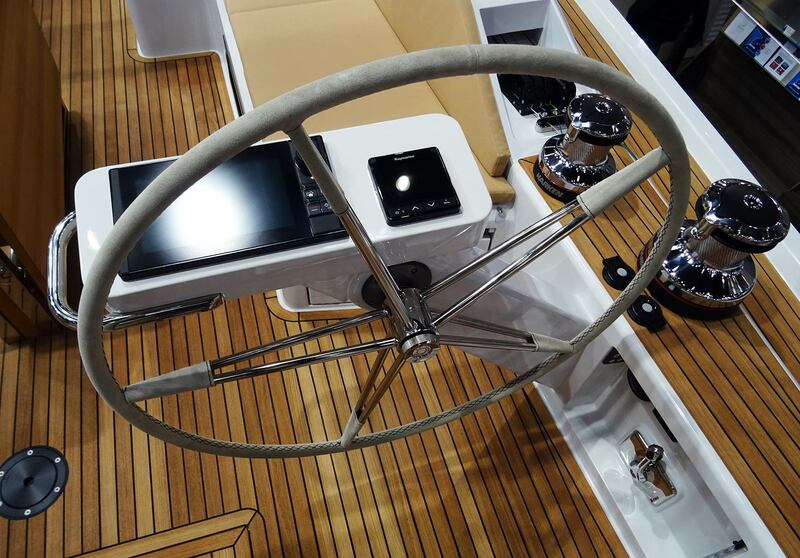 The defining element of the hull is the large targa bar over the cockpit that hosts the mainsheet system and will keep the cockpit free from ropes. I must admit: I hate targa bars. I really do. But on the other hand, it looked surprisingly handsome and kind of speedy on the Grand Soleil. Her hull is unquestionable fast. The slim bow will cut the waves for sure, a waterline length of 12.72 meters with a maximum beam of 4.41 meters will provide for fast passages especially on broad reaching points of sail. The really huge portholes are a refreshing contrast to the otherwise mostly as slim as possible cut out counterparts of X-Yachts & Co. Somehow the whole appearance of that hull seemed complete and nicely done. Let´s hop onboard. Signature of Grand Soleil are the invisible lines running through the coaming of the cockpit: At the end the clamps and winches are positioned slightly offset so that from here two lines could be managed at either side at the very same time. That´s efficient and a neat solution I would say. I loved the cockpit´s seating area. Most cockpits would feature simple settees whereas on this Grand Soleil there is a L-settee form on each side. This solution will provide for a nicely hospitable location when there are guests on board mooring in the harbour. Mighty steering columns hold the wheels, of course, on this boat a push-button-sailing system had been installed. Nice steering. But can you turn the crank full circle on that Genoa winch? What I found a bit odd was the proximity of one of the winches to the wheels – I doubt that a full circle crank turn is possible in this configuration. Let´s hope the electric winches won´t fail. All in all the cockpit was roomy but at the same time transported a sense of safety. Notice the back rests on the aft locker-seats. 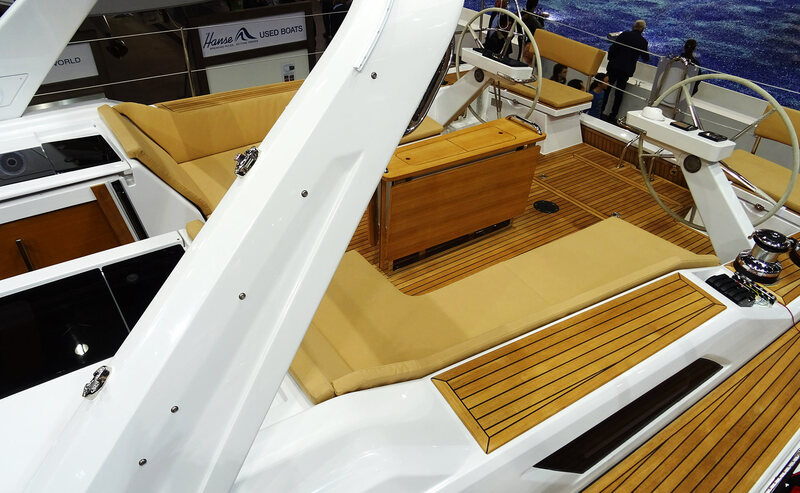 I rushed to see the interior of this cruiser as I was curious how Grand Soleil – known for fresh Italian design – was defining cruising in style. What shall I say? Lots of wood, which I instantly loved. 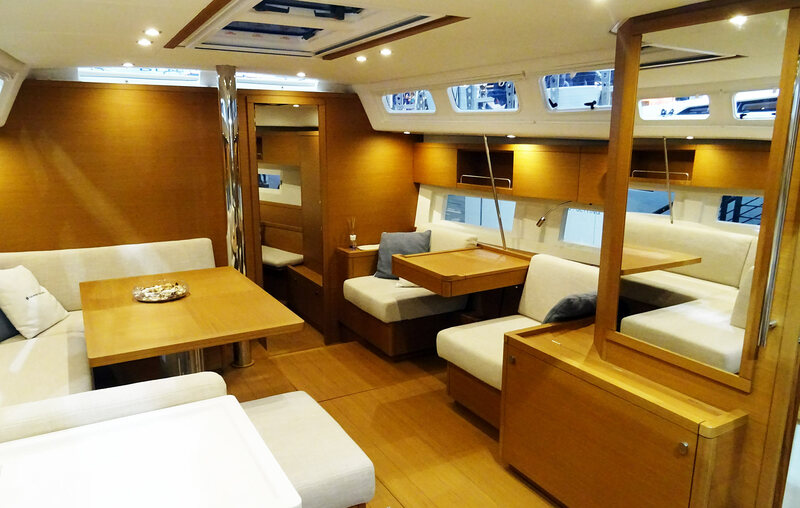 The classic layout with a galley on the port side, heads vis-à-vis. Then further through the saloon a large U-settee that would be able to host 5 persons easily around a fixed, non-folding table. No options here, no mish-mash. Nice white cushion. Classy. Navigation station had been positioned on the starboard side instead of a settee with two more seats available. This configuration will enable a skilled navigator to do his chart work on a proper chart table facing up front as well as serve as a table for a game of chess with two persons facing each other and it finally reminded me somehow of the Captain´s chairs-configuration in the Hallberg-Rassy. What I particularly liked was the big mirror at the head on the right hand side which was enlarging the whole room visually. And old trick that still works. There is a retractable TFT underneath the mirror. Here we have it again: Mediterranean luxury sailing. Anyway, I loved the straight lines, the ensemble of the colours and the mixture of classic layout with new ideas. The galley should be big enough to make the ship´s cook happy in providing meals for the crew or mixing the Mojito sundowners. All in all, this is a saloon with a lot of light and a lot of wood. 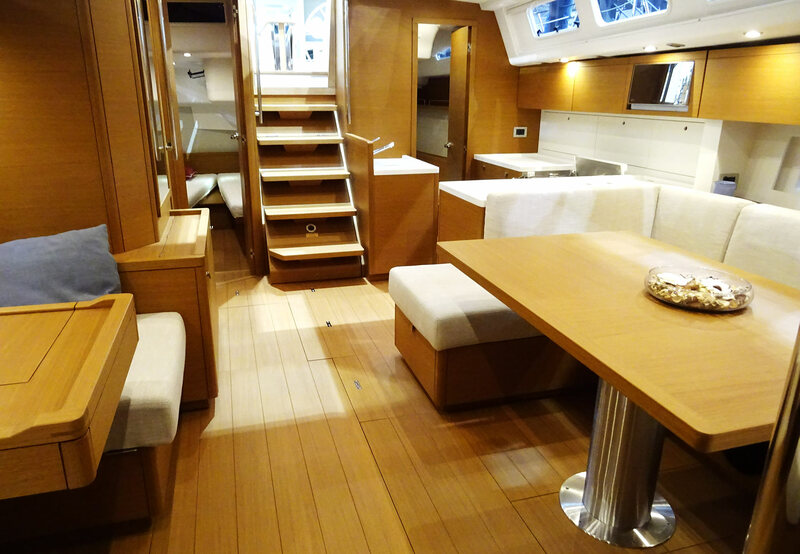 Somebody looking for contrasts won´t find any, even the floor decking is made of the same wood as the bulkheads and furniture, turning the saloon into an oasis of uniformity – in the best sense of the word. I went to the bow where I entered the owner´s cabin. I was surprised with a lot of space around the island bed on the one hand and on the other hand with a somehow restrained design: Understatement? Normally, it´s the fore cabins where a yard would invest most of the bling-bling to persuade the buyers. Instead, Grand Soleil chose to go for plain beauty. And that´s all. 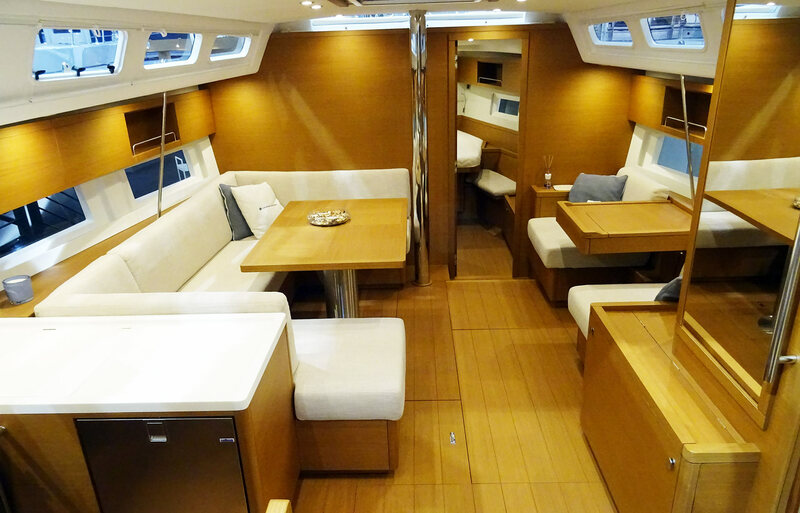 For the aft cabins this boat did feature two versions. 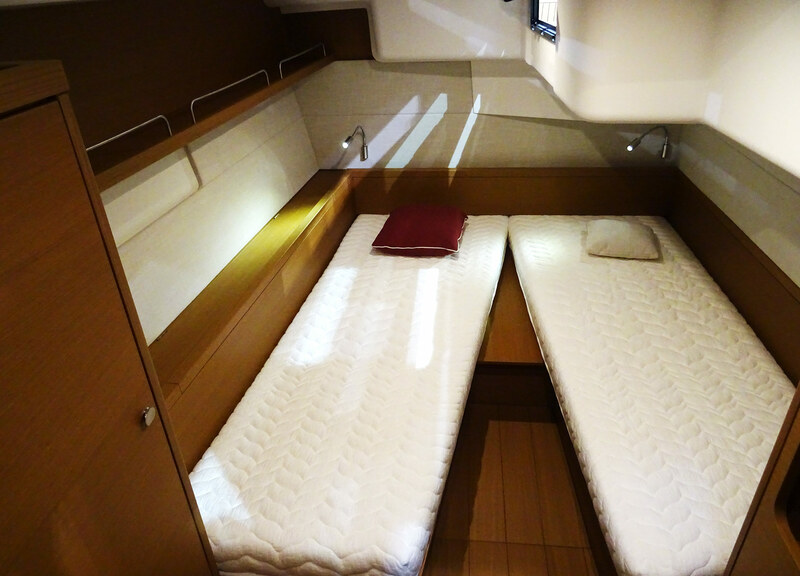 The port side cabin with the usual huge double berth. 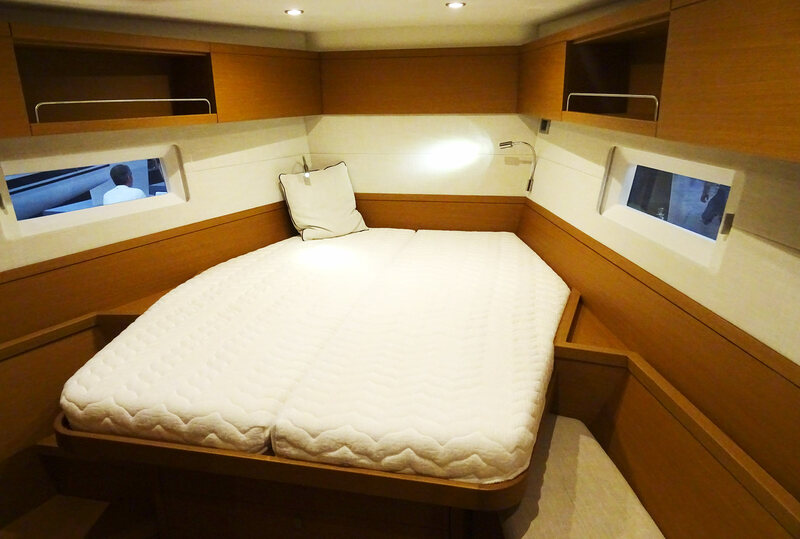 More than enough for a couple in love to spend cosy nights and off-shifts cuddling and enjoying the gentle swell. Stowage there was plenty of and again the nice understating design. Leaving the boat I wandered around the hull multiple times when I found some displays which were really interesting. Grand Soleil had a cut up floor part of the hull construction at display where one could see the strength of the material, the thickness of the stringers and the manner in which the keel bolts and counter plates are installed on those boats. This gives confidence in the craftsmanship of Cantiere del Pardo and is a harbinger of the sailing characteristics of such a boat. I can imagine that these boats are serious performers when it comes to trim the sails to squeeze out every tenth of a knot. Very sturdy and strong. 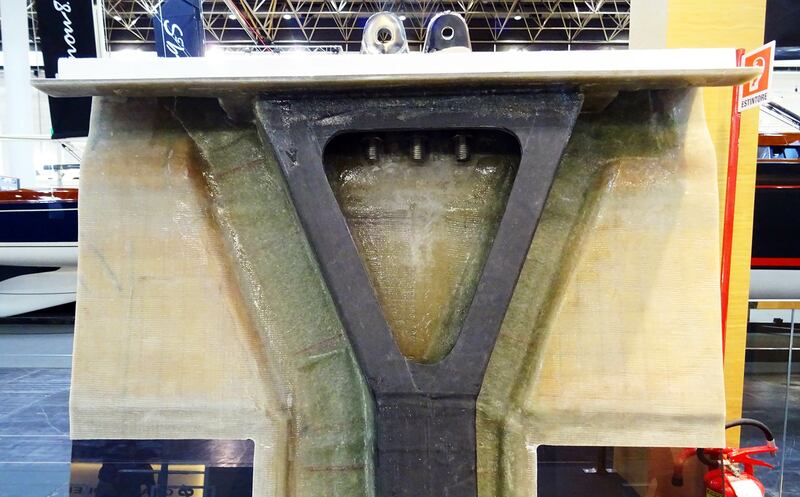 For the stepped mast yachts in their range they had also a cutaway model of the mast shoe-section at display. Which was very interesting as I had never seen such a construction in real life. Between outer and inner hull there was a rock solid cuboid made of … well, I don´t know … but it proved to be very, very hard as I knocked on it. 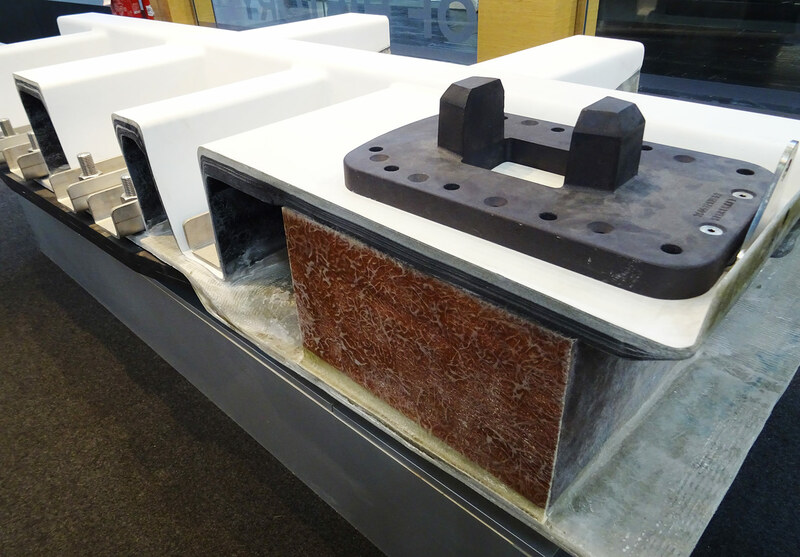 At last I was very excited to see how Cantiere del Pardo makes their chain plates: It´s much more than just metal plates to which the shrouds are connected (as with my own King´s Cruiser, read about my chain plate refit here and here). 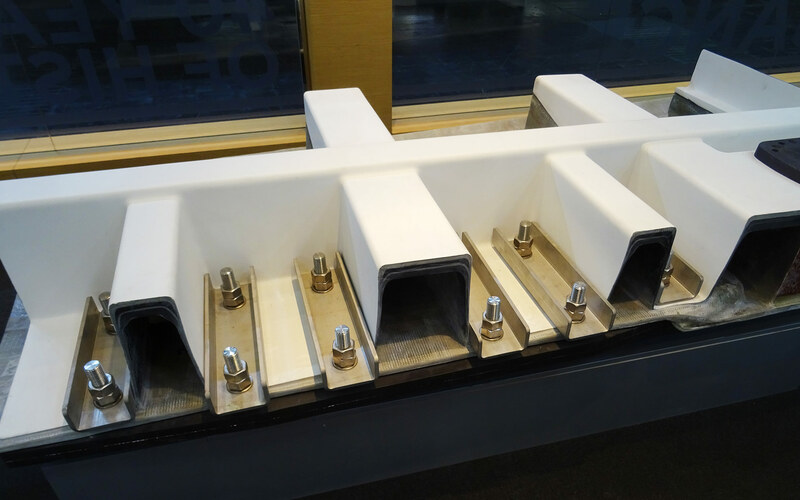 There is a thick metal stringer running down all the way to the bottom of the hull laminated to the outer hull to which the chain plates are thickly bolted. Very impressive! In the end: The perfect sailing yacht? So, in the end, would this be the perfect sailing yacht? I could imagine that this Grand Solail 46 Long Cruise comes very close to that definition. I loved her cockpit layout (apart from the odd winch-steeringwheel “problem”), I was astonished by her light-suffused, plain but valent interior, the classy design and nice massive joinery. 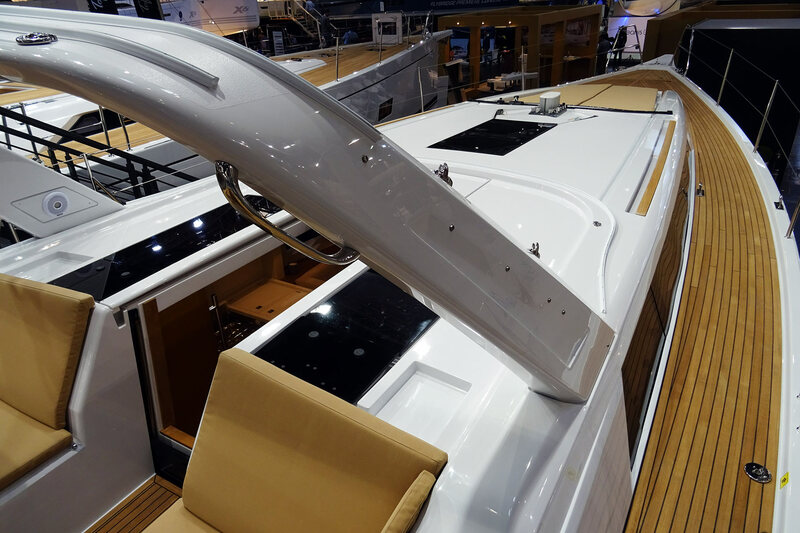 The hull should be a fast sailing performer and even the targa bar somehow adds to that speedy look. It must be a pleasure to be at the helm of such a boat. And looking at the Performance models there is a certain tingling in my toes to one time return to Forli and Cesenatico area, but this time not for racing a bike but to sail this racy yacht. 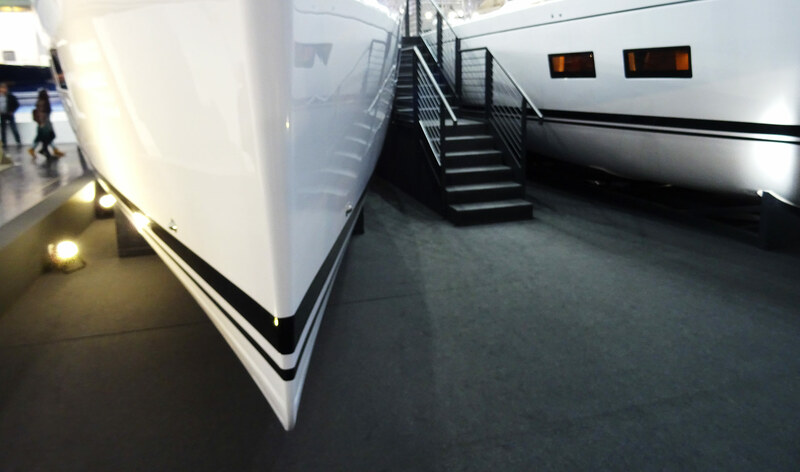 Please browse all articles related to the Dusseldorf Boatshow by clicking on #boatshowdusseldorf hashtag.